Hello beloved friends and supporters!!! I'm never quite sure what to title my updates so you'll have to excuse my lack of creativity. Begging your pardon if you would have liked my runner-up title: A September to Reptmember. Yeah, I know. Regardless, this is about September and what God has done this month. Where do I even start?! Thursday Night Focus: Our weekly meetings have been so encouraging. We have been seeing a lot of new students that consistently show up every week. They're getting involved, making friendships, going to core, doing one on ones with people, and even leading us in praise and worship! We've filled up the cafeteria every week as we celebrate what God has done and is doing in our lives; it's exciting. Discipleship Class: We've never done this before. 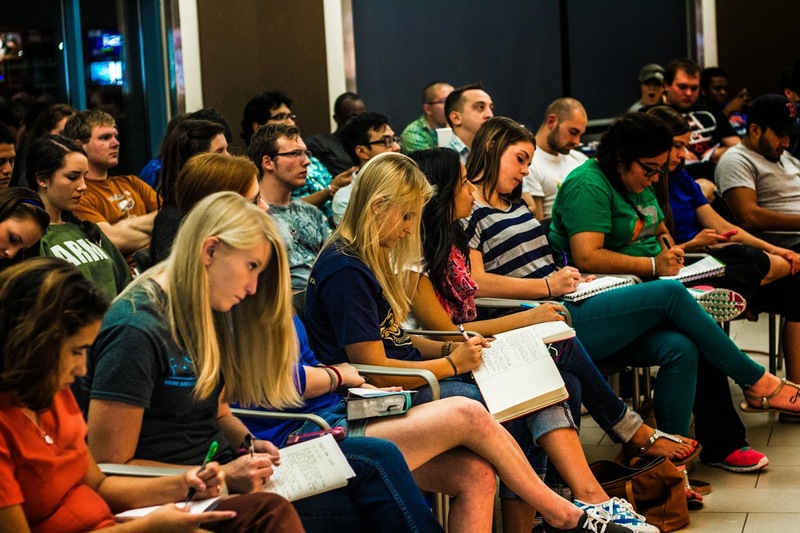 This year we decided to have a class that met on campus once a week that was aimed at making disciples in a more academic environment. The class has a syllabus, we're covering the gospel of Mark, and they even read through the entire New Testament during the length of the class. It's another way to make sold-out, fired-up, and radical disciples and we've been seeing great results! We've seen it triple in size over the first few weeks, and we're hoping to see even more get involved. It is taught by our staff at Collin (Tyler, Brianna, Melissa, and myself) and it's been going great! Core Groups and Corefas: These are the heart of our ministry. Our corefas this year are PHENOMENAL. They have done a great job leading their core groups and have set up one on one Bible studies (that we call Focus on Jesus) with numerous students. Each one of our corefas studies with about 2 to 3 students and those have been going well! Did I mention our corefas are PHENOMENAL?! 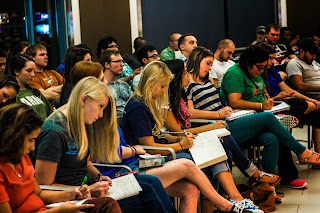 Preston Ridge Focus: Hey, did I mention we started a Focus at Collin College Preston Ridge campus this semester? Did I also mention it has 15-20 people a part of it now? And that they're great and ready to build God's community on their campus? Cause that's happening! If that doesn't seem like a big deal it's because it's not...it's a HUGE deal. God is moving there, folks! Finally, Outreach: We've seen a lot of seekers interested in Focus this year. They're attending Thursday night, core, and even one on one Bible studies to figure out what Jesus is all about. It's so cool to see how our students love and care for everyone that comes to our ministry regardless of where they're at in life. God is drawing them and I see our students being faithful to the mission with this. I can't tell you how excited and thankful and encouraged I am. God is moving powerfully. His Spirit is being poured out on our campuses and I can see it. But we need so much prayer. Will you go through the topics above and pray for us? Pray that we move as God moves, that we go only as God directs, and that we're faithful with the mission of bringing Jesus' gospel to people. I can't tell you how thankful I am for you; without you, none of this happens. You're in my prayers!